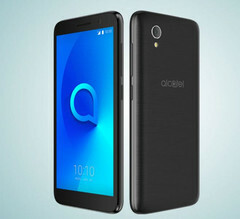 Alcatel has unveiled its newest device, the Android Go Alcatel 1. The device features a 5-inch 480x960 display, 1 GB of RAM, 8 GB of storage, an MT6739, and a US$89 price tag. Alcatel released the Alcatel 3 devices at MWC a while ago. The company went a step further two weeks with the unveiling of the Android Go Alcatel 1X, the first of its kind by the French company—and has now followed it up with an even cheaper Alcatel 1. The Alcatel 1 sports an 18:9 5-inch display with a 480x960 resolution. The 1X opted for a slightly larger 5.3-inch display, so this is a slight drop in screen real estate. Like the 1X, it's powered by MediaTek's MT6739 entry-level SoC. RAM is stuck at 1 GB, and storage is a paltry 8 GB. There's a 2000 mAh battery giving it juice. There's a 5 MP camera at the back of the device, and a selfie shooter interpolated to 5 MP with software. In any case, it's a bit unreasonable to expect anything more than a functional camera in this price segemnt. Speaking of price, the Alcatel 1 has a US$89 price tag, making it US$10 cheaper than the 1X. It's fine value for money, by all metrics, but buyers would probably be better served opting for the significantly more impressive, slightly more expensive Redmi 6. The Alcatel 1 is available in Metallic Blue, Metallic Gold, and Metallic Black.